The Sam Houston State University Master of Fine Arts in creative writing program will welcome poet Jamaal May to campus on Monday (Nov. 19), as part of its on-going reading series. May, the author of Hum (Alice James Books 2013), winner of the 2012 Beatrice Hawley Award, as well as two poetry chapbooks (2009’s The God Engine and 2012’s The Whetting of Teeth), will give a public reading of his work at 6 p.m. in College of Humanities and Social Sciences Building Room 70. The event is free and open to the public. In addition to his public reading, May will meet with the department’s undergraduate and graduate creative writing students for discussions about the art and craft of poetry, as well as the challenges and pleasures of a writing life. The question-and-answer session will begin at 3 p.m. in Evans Building Room 212. May was born and raised in Detroit by two auto workers, one a quiet lover of books and the other a boisterous Baptist preacher. During a stint as a hip-hop artist/producer, he began writing poetry as a self-taught slam performer. Shortly after, he began studying verse seriously under the mentorship of Detroit poet Vievee Francis-Olzmann. Since then he’s gone on to win several honors, publish widely in literary journals, share his work with hundreds of audiences, and receive a Master of Fine Arts degree from Warren Wilson College. 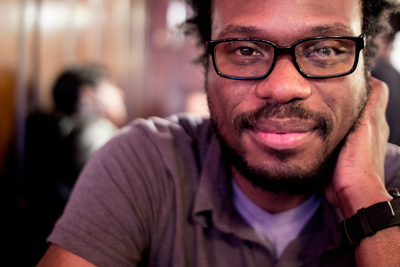 His honors include the 2012 Beatrice Hawley Award from Alice James books, fellowships from Cave Canem, Callaloo, and Bucknell University; scholarships to the Bread Loaf Writers Conference; an International Publication Prize from Atlanta Review, and finalist nods for the 2010 and 2011 Ruth Lilly Fellowships. Currently, Jamaal is the 2011–13 Stadler Fellow at Bucknell University where he hosts a poetry slam, acts as associate editor for the lit journal West Branch, and works on his second manuscript, The Big Book of Exit Strategies, as well as several short stories and essays. May’s work has appeared or is forthcoming in New England Review, Michigan Quarterly Review, Callaloo, Indiana Review, Blackbird and Verse Daily, among other journals, magazines, and anthologies. He has appeared on radio, television, and in documentaries such as “A Poet in Every Classroom” and “Televising a Revolution,” jury prizewinner at the 2010 Trinity Film Festival. Remaining active in the poetry slam community, May is a three-time Rustbelt Regional Poetry Slam Champion, two-time Detroit Slam Champion, and two-time Individual World Poetry Slam finalist, finishing as high as second place. He has coached three Brave New Voices youth slam teams, taught poetry classes through the Inside Out Literary Arts Project, and given readings, lectures and workshops at schools, bars, libraries and living rooms across the United States and Canada. For more information about May’s visit or other upcoming readings, contact Kaukonen at kaukonen@shsu.edu or 936.294.1407.